Yea, it’s one of those – a relaxing wine n dine session where u don’t need to worry about the bill, and kick-back. 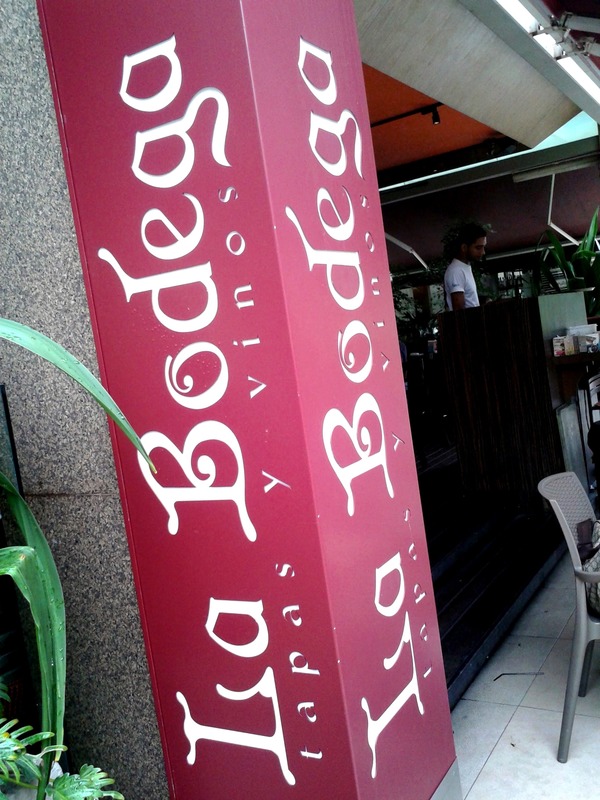 La Bodega in Bangsar Shopping Centre (BSC) (2287-2768) has just started its Sunday chillout called El Corazon Del Vino (The Heart of Wines), where guests can enjoy free-flowing wine of the month and food from noon till 4pm. The deal is very reasonably-priced too, at $60++. The featured wine was a sherry, Tio Pepe from Jerez, Spain. White sherry reminds me of sweet tuak. This is the wine of the month for September. The bar made various cocktails using Tio Pepe, but the welcome drink was an Aperol Soda. A light intro to the session. 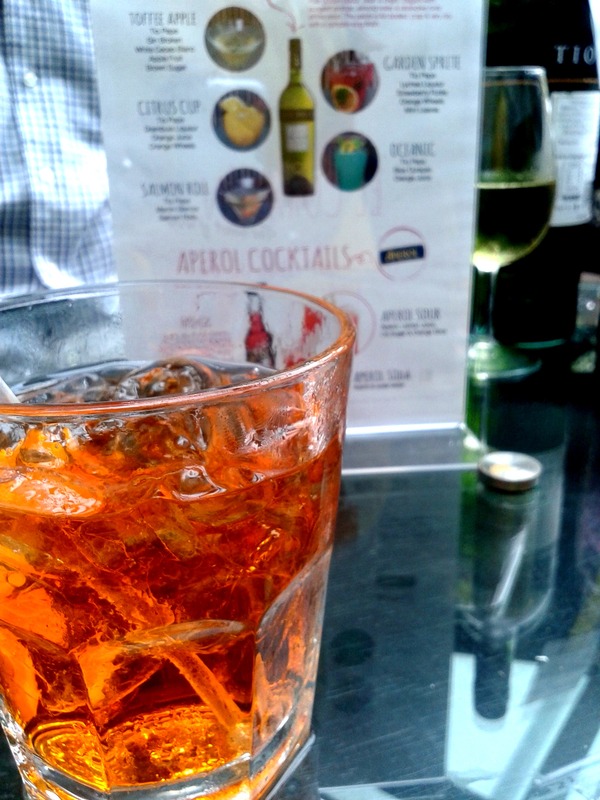 Aperol is a Campari-like aperitif. 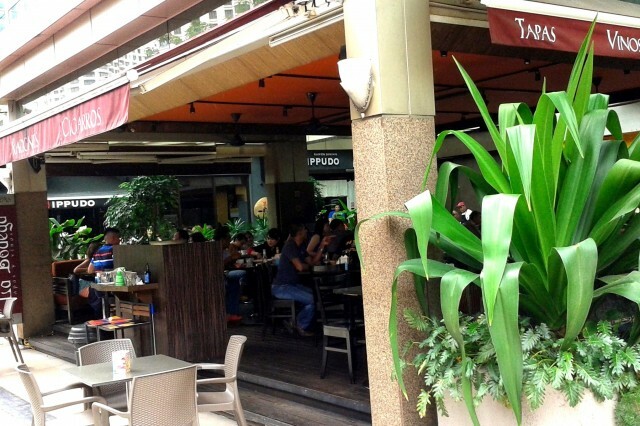 The drink is lightly-alcoholic, with herbal scents and a hint of vanilla. And refreshing in that it does wake you up. My buddies dug into the food soon after. The spread each person gets is impressive. 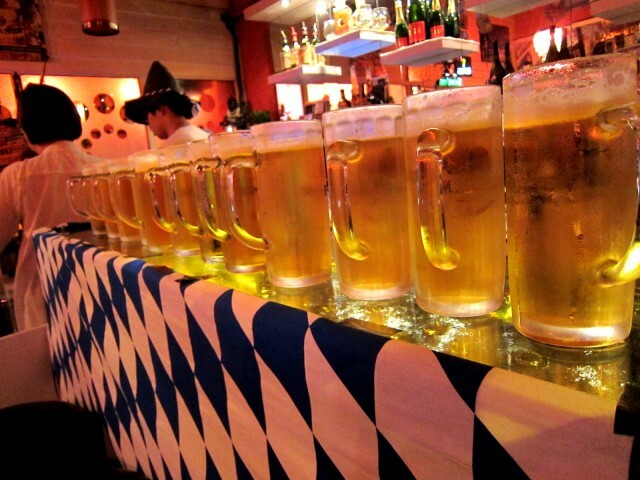 Enough to get your stomach to chill, and entertain the booze you’re feeding it. 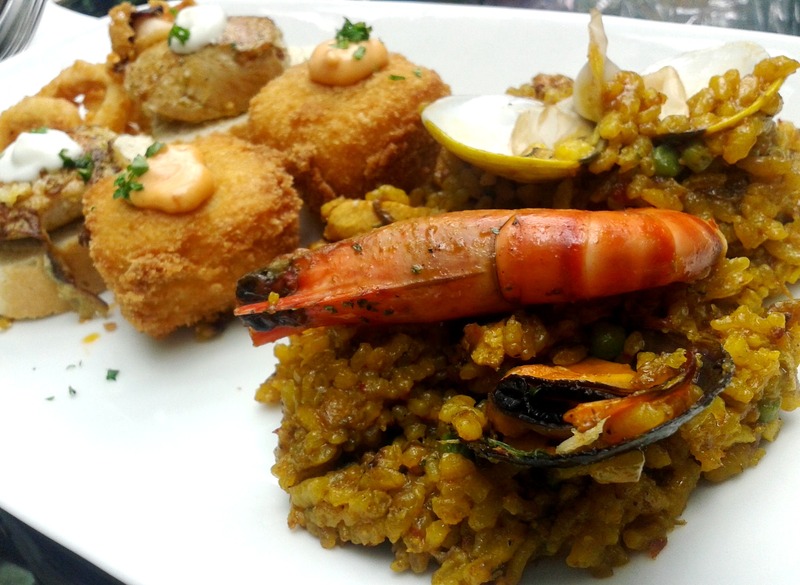 The canapes platter served to each guest was good; it contained Paella Valencia (with prawns, clams, chicken and mussels), Croquetas Bacalao (cod fish croquettes), Pinchos Morunos (chicken on toast), and Calamares Fritos (deep-fried calamari rings). While for dessert, we each got some stuff. Among the cocktails we had was sumtin that looked like late breakfast – a martini consisting of Tio Pepe and Martini Bianco shaken and strained into a glass – with smoked salmon rolls on a stick swimming inside. I was neutral about this; my friend liked it. “Bite the salmon then take a swig” was the insight. I dig the Garden Sprite. 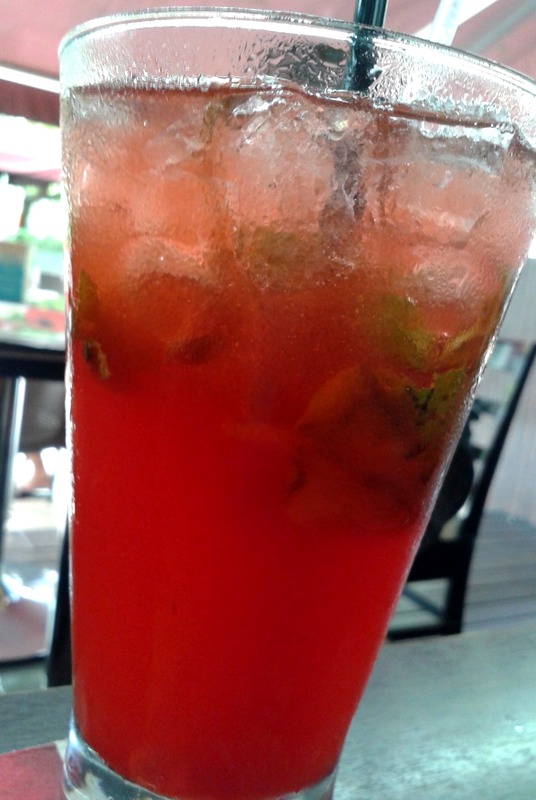 This baby has Tio Pepe, lychee liqueur, strawberry puree, orange wheels and mint leaves. It’s like a fruity rather than tangy mojito, but with sherry flavours. The Citrus Cup is a goblet of oranges made with Pepe and a dash of Drambuie. Other cocktails served were Toffee Apple, Oceanic, and Aperol Sour. 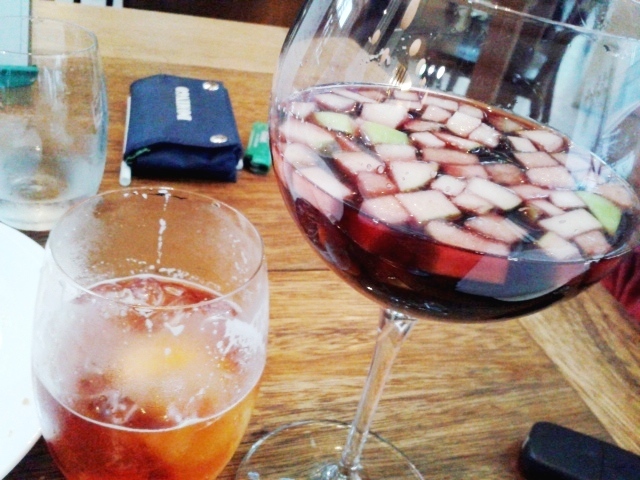 However, all drinks had Tio Pepe as the base, which can get a little too much, as its flavour is prominent. So this one at La Bodega? Am gonna hit it again for sure. 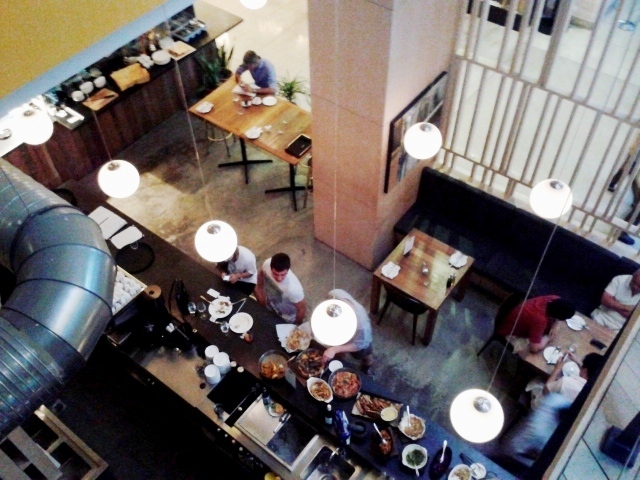 Probably the best Sunday wine brunch in KL right now. 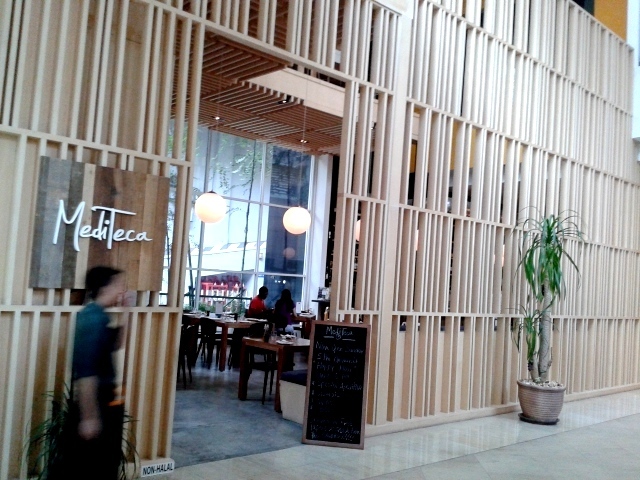 Mediteca Tapas Bar (2181 -2426) is one joint i never knew was there until i paid a visit. It’s got a great spot, smack downtown at Fraser Place, and occupies the front of the building. The set-up is stylish. 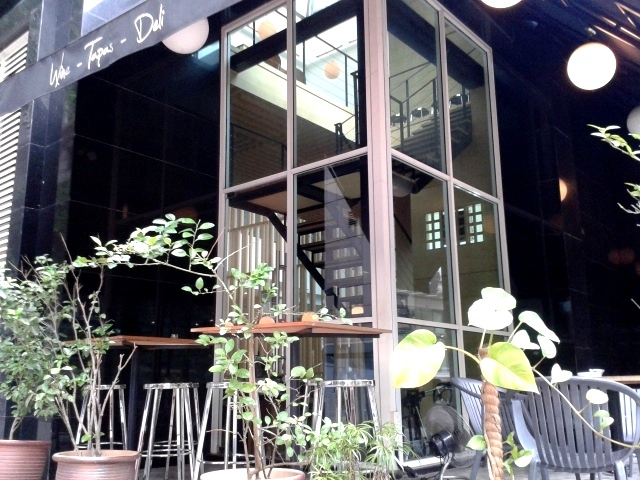 Checked it out on a Sunday afternoon for a cocktail session. The place has a little bar as well, but we opted for a table by the all-glass wall. 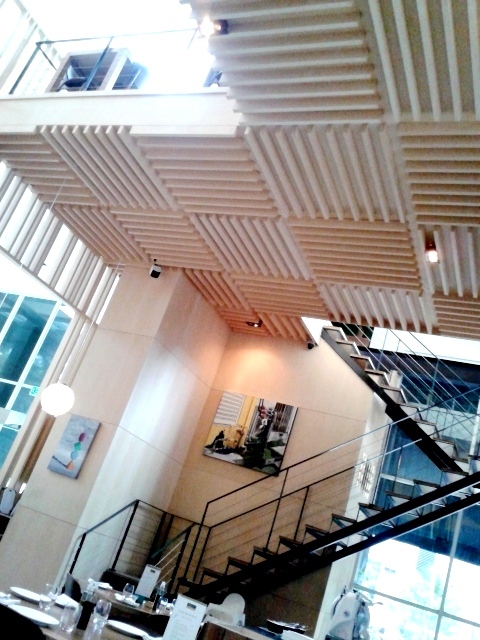 As in floor-to-very-high-ceiling glass! Nice. 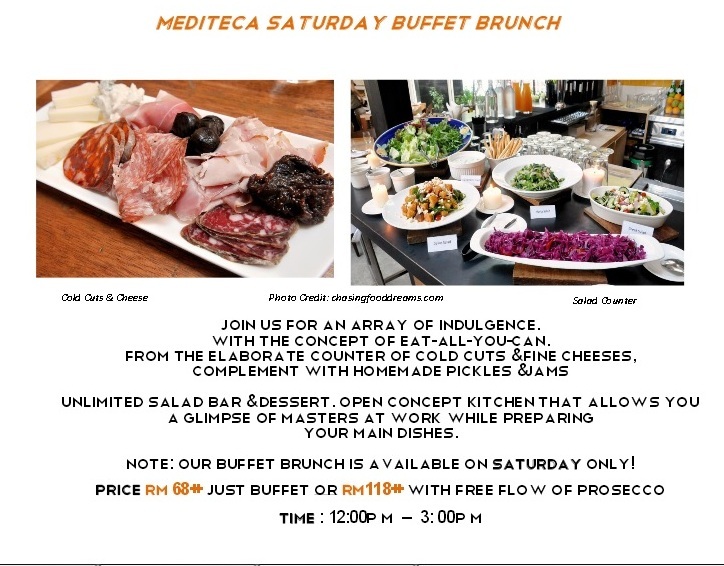 Mediteca’s Sunday Happy Hours here is one of its unique features. 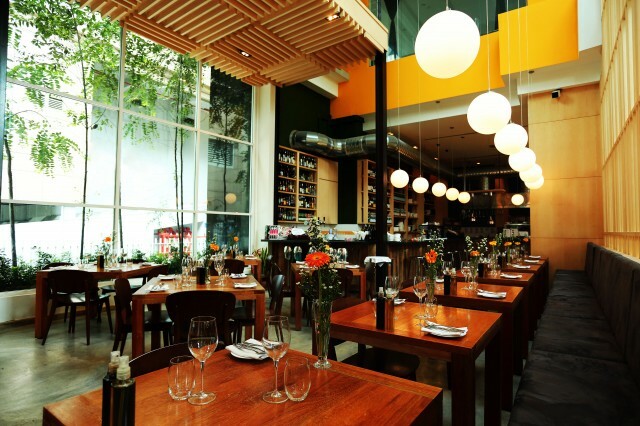 It applies a trend that began in bars in Milan, Italy, called Aperitivo alla Milanese, where patrons get complimentary buffet food when they drink. When we were there, the Sunday cocktails were focused on aperitifs, mainly Campari-based ones. The cocktail specials changes every Sunday. Guests can opt for beer or wine as well for this unique happy hour. The afternoon began with a Negroni (Campari, Martini Rosso & gin), which is a classic ol skool cocktail. Bittersweet, quite balanced, tho i let the ice melt a lil to dampen the sweetness. 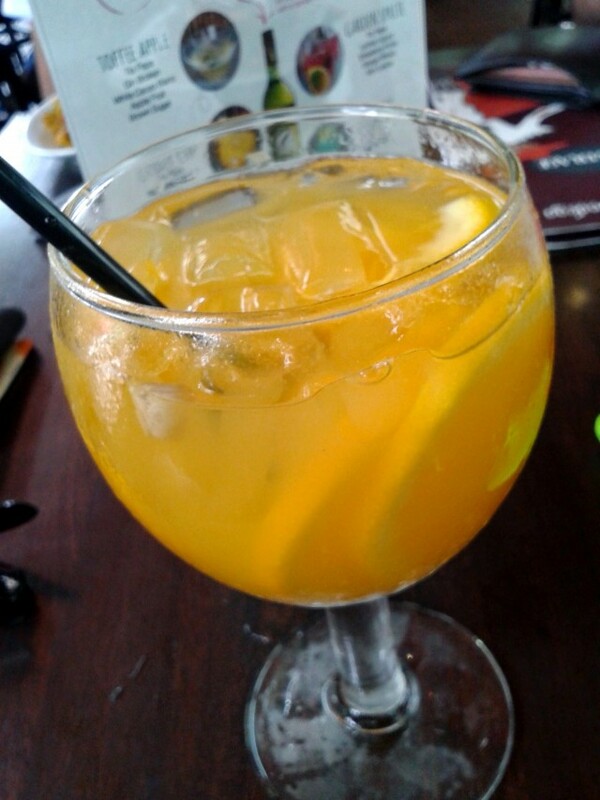 A slice of fresh orange adds some refreshment. Campari is an Italian liqueur, an infusion of herbs and fruit, and to me, is very bitter. 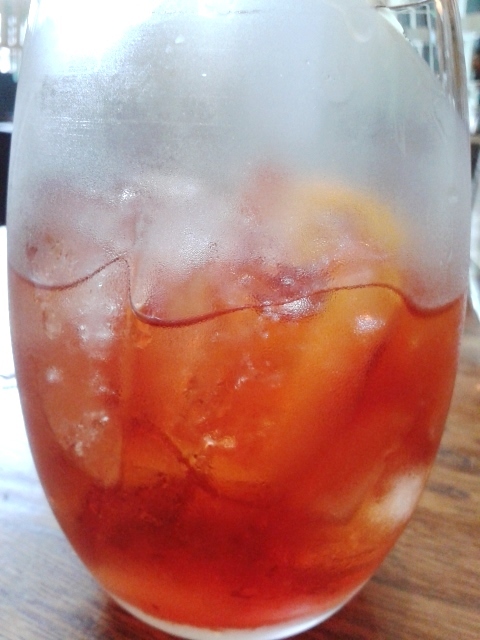 A variation of the Negroni, the Negroni Sagliatio (or the bungled negroni), rocked my boat. There’s fizziness, with some prosecco taking the edge off, adding that light champagne sweetness; makes it fruity even. Awesome. The Aperol Spritz is a mix of prosecco, Aperol and soda. It’s a tarty sparkling wine cocktail, with the Aperol introducing itself at the end with a bitter-orange finish, as it’s an orange liqueur. We tried the Americano too, which tastes a lot like the Negroni, ‘cept gin is switched for Martini Rosso. 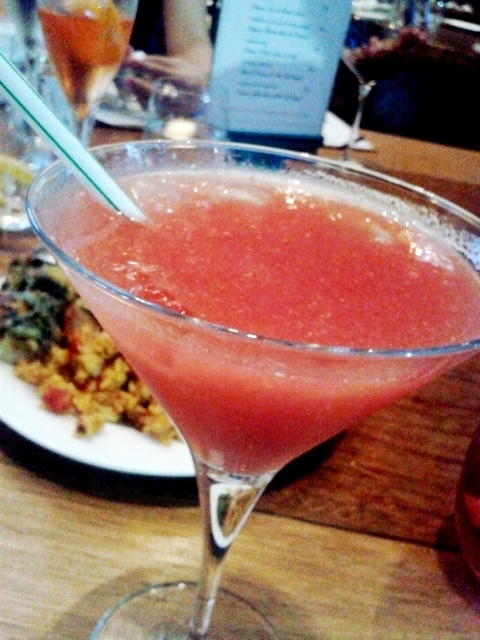 Mediteca’s strawberry daiquiri is well-made, strong, with a good consistency. 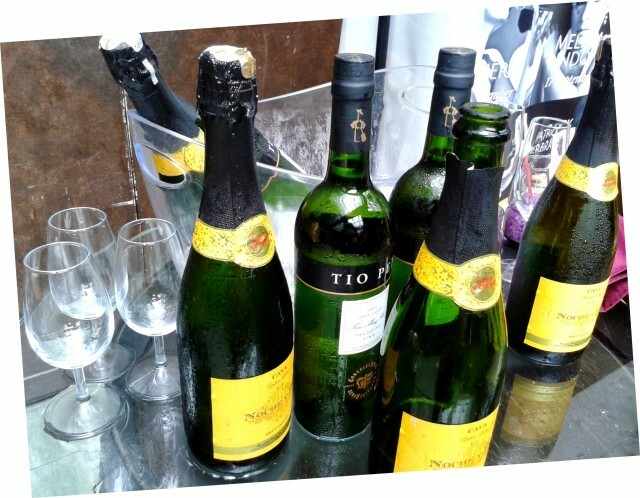 We tasted the outlet’s house prosecco, and it was quite pleasant – medium to dry, the right fizz, and a sweet-sour tinge that lingers for a bit. Good marks on all the drinks. All spirits used are premium, none of ’em moonshine many bars use. The food: it’s light Mediterranean stuff; crowd-favourites like pizza, breads n dips, seafood paella, some interesting sauces n salads, and a couple of other light bites. The olive oil-drenched pesto salad was funky. Weird. Me liking a salad is like an alco liking a shandy. Sumtin called a spelt salad. Basically what’s laid out, changes. It’s whatever the chef can cook up on that day. 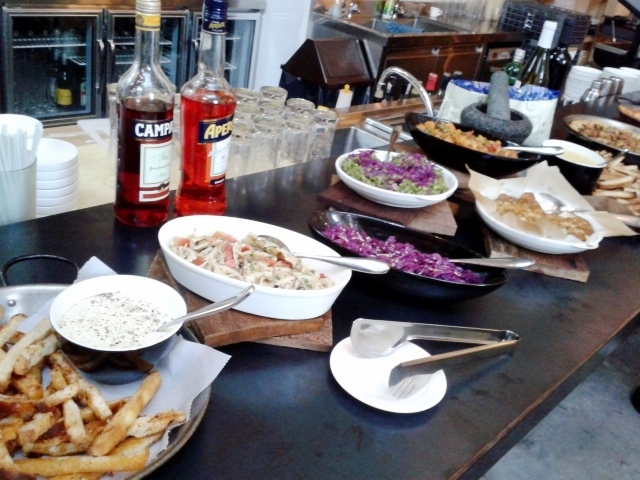 It’s not meant to be a meal, but a snack with drinks, or as a pre-dinner session. However, food quality is decent. I had no issues with anything i had. Loved the potato chips, which came in soft slices. Unreal. 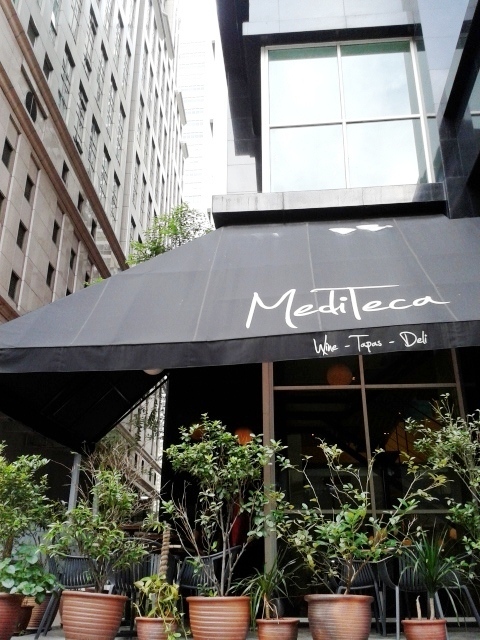 To enjoy the spread of Mediterranean grub, all you need to do is enjoy the cocktails, which are generally about $28.75 nett. This Milanese happy hours thing could grow on me. And i like the spot too. Should be hitting it again in the future. Very likely to blaze their Saturday Prosecco Brunch as well, from noon till 3pm. They got cheese too. 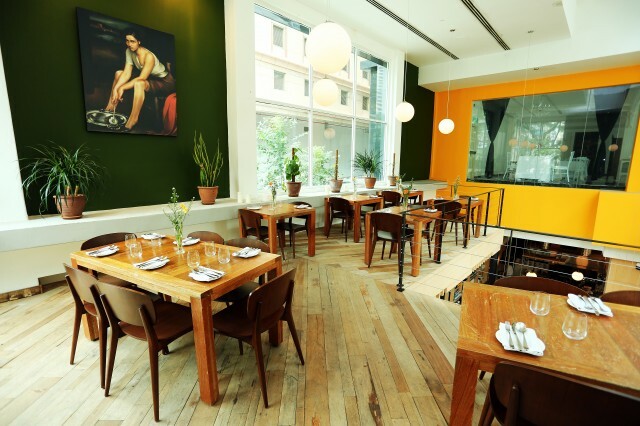 Cost is $135.70 NETT, with all-you-can-drink prosecco. It’s a sweet deal, if i stay sober on Friday nite. Some interesting cocktails are available too. We opened with sumtin called Grinch (Creme de Cacao White, peppermint liqueur, Midori, milk). 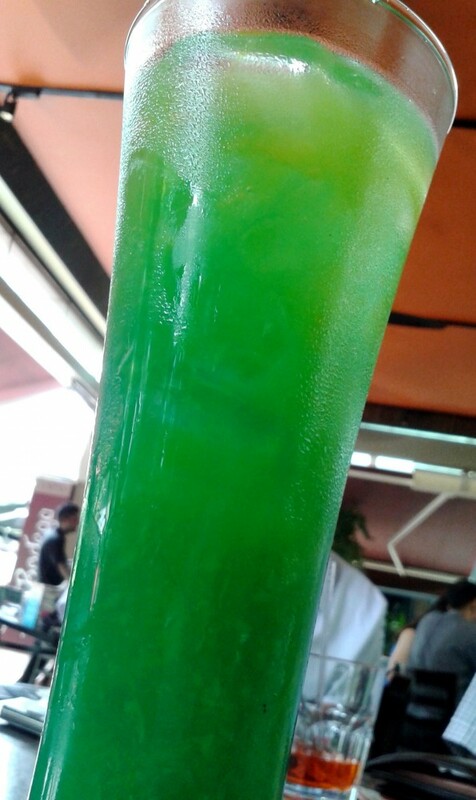 It’s melony n refreshing. 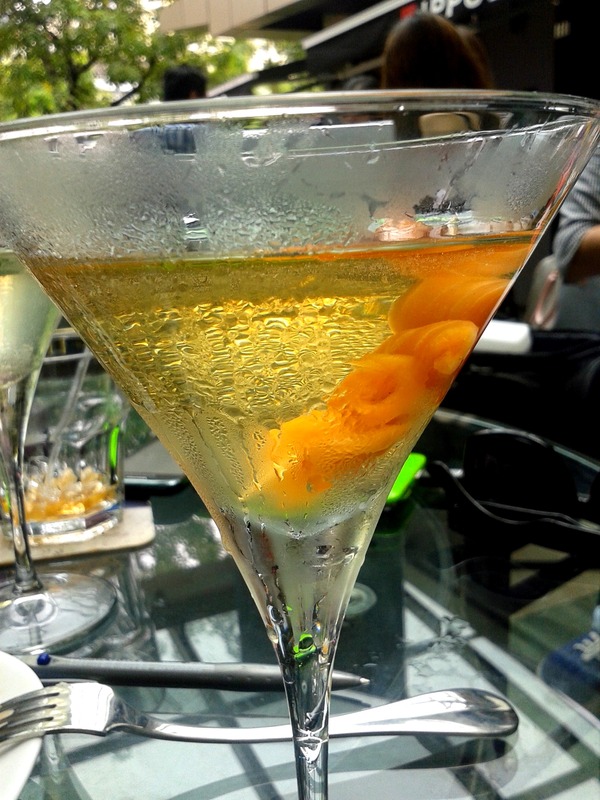 And well-balanced – which is a rare thing when it comes to cocktails. Am obviously no salad freak, but the prawns in the Press Room Prawn Cocktail were great – fresh n crunchy, with fruity, sweet-sour flavours from the dressing. There were a couple of other salads lying around which i ignored. 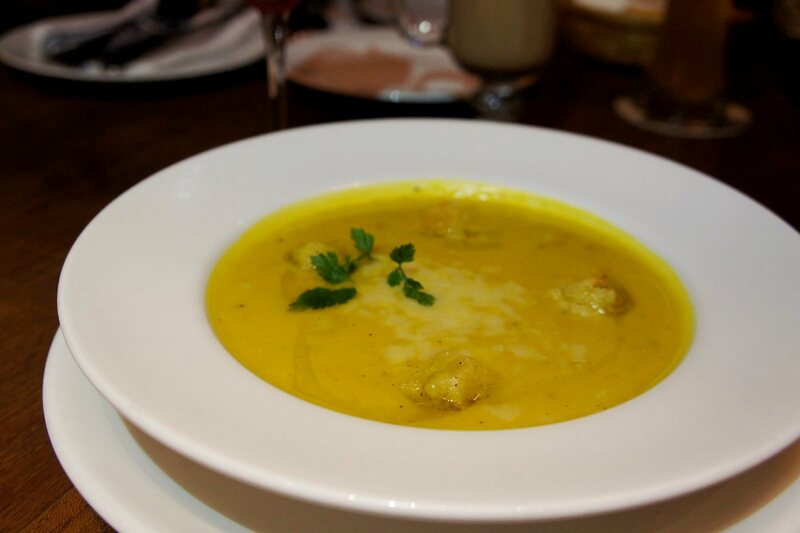 The Roasted Pumpkin with White Truffle Oil soup is gooood. Thick n creamy, with random chunks of pumpkin surprises. The Steak Tartare here is excellent. 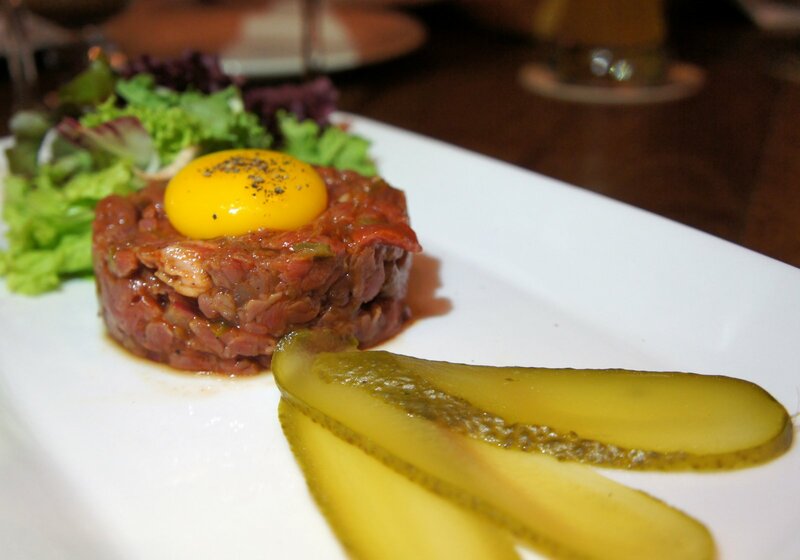 Raw beef bits which are tender, fresh, spicy, with pickled bits n herbs adding to the party in your mouth. 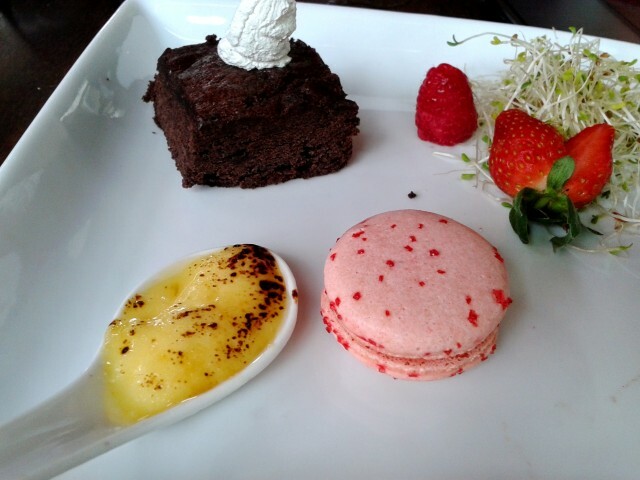 I had the 25th Toast next (strawberry puree, passion puree, cava). 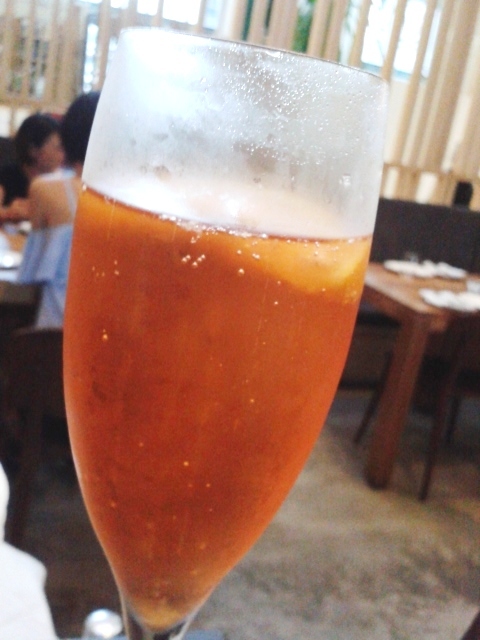 Sourish, bubbly & strawberry-like, served in a champagne flute. Pretty OK if you like sour stuff, but it should have been served a lot colder. 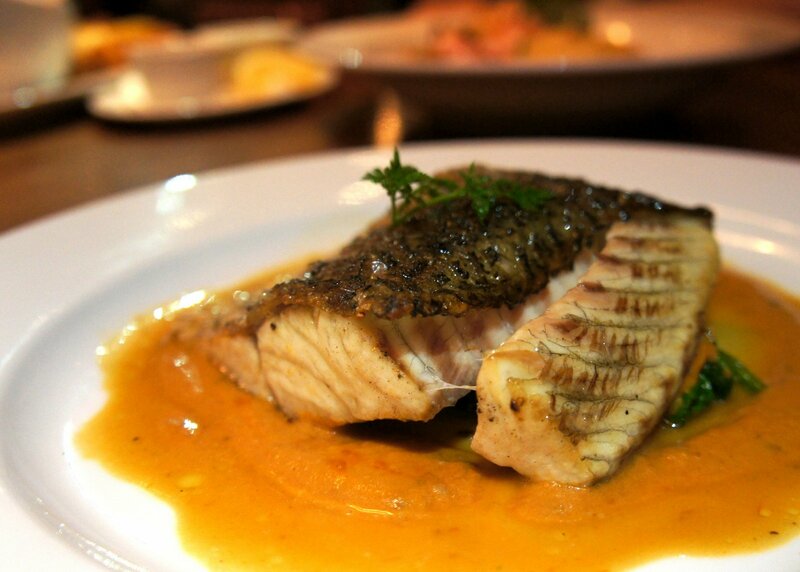 I’d definitely have the fish dish again – Sea Bass with sautéed spinach and sun-dried tomato cream sauce. Tender, juicy chunks of white flesh, with just the right marination and baking time. And for the traditionalists, there’s Roast Turkey with chestnut stuffing, roasted sweet potato mash and cranberry sauce. 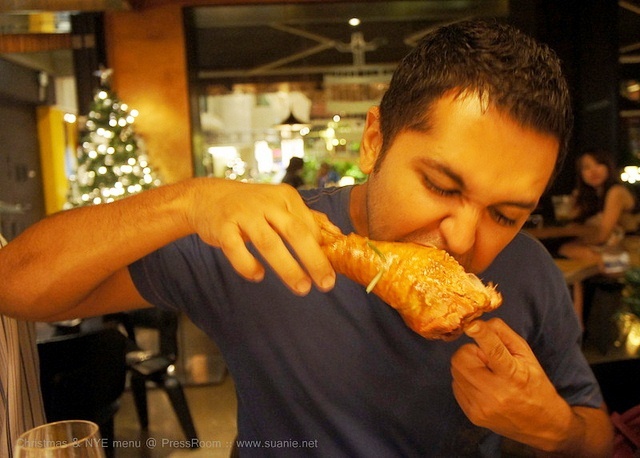 It’s a bigass drumstick. Basically, for those who want a caveman meat fest. Would have preferred more sauce / gravy. As am cheesy, i dug the Oven-baked Herbed Provolone. Semi-hard, baked cheese. Slightly chewy. 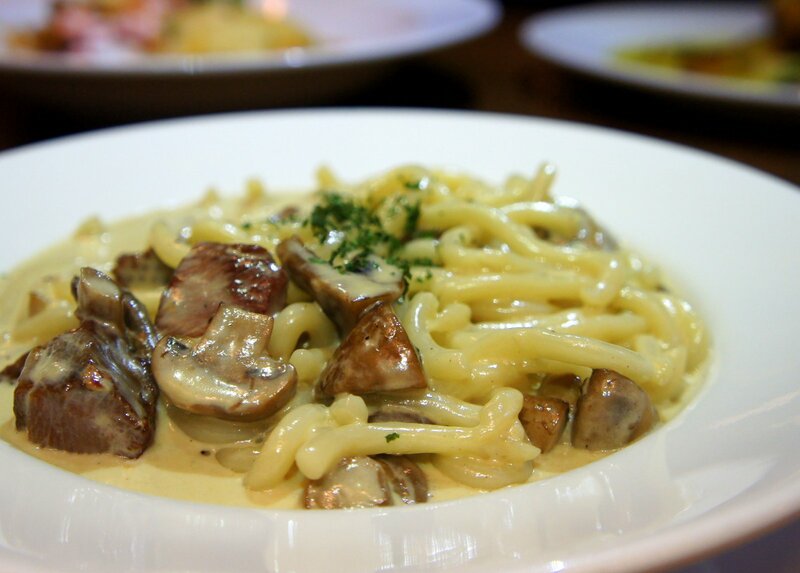 I enjoyed the Udon Carbonara, with smoky, flavourful duck, and the meat is particularly strong-tasting. 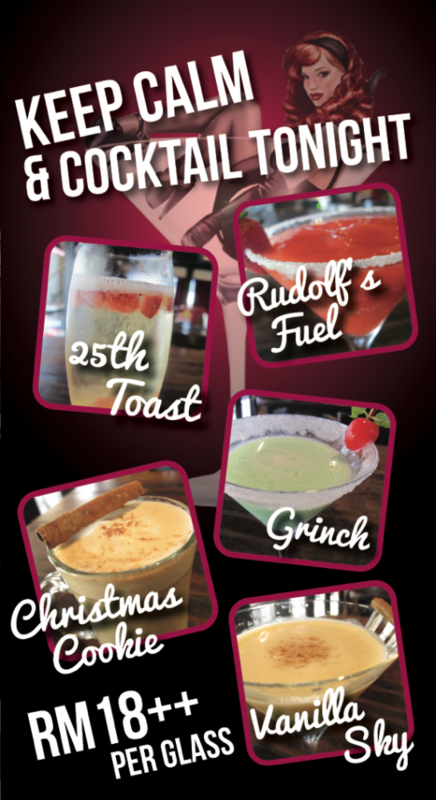 Rudolph’s Fuel is an excellent cocktail served in a martini glass. It’s like a strawberry smoothie, with a boost of course – rum. Tilting a lil towards the sweet side, but still very enjoyable, with its ingredients being Matusalem (Platino), banana liqueur, strawberry puree and Creme de Cacao (White). 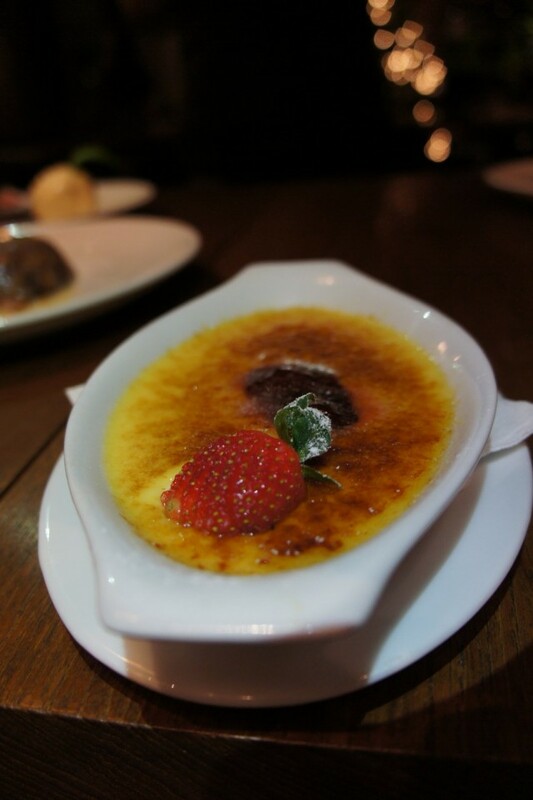 Crème Brûlée with Strawberries was one of the designated desserts. Pretty good. But my dessert was Vanilla Sky – Matusalem (Platino) rum, almond syrup, vanilla chai, egg n milk. It’s strong, nutty, with spice hints due to floaters of cinnamon bits (which i thought was chocolate n tried to eat. Bad idea). I wdnt recommend the margarita or mojitos. I tasted mainly sugar n nothing else. 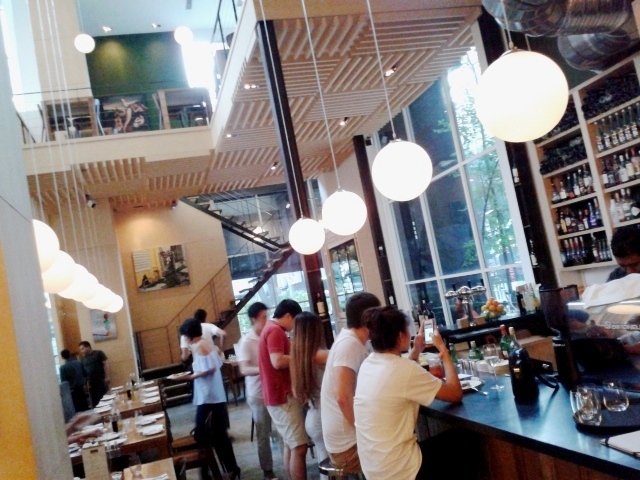 Overall, dining here is a good experience. The atmosphere is nice, the food quality high, and the Christmas cocktails enjoyable. Reservations required – 03 2095-8098. Merry Christmas everybody! Drink on; rock on! 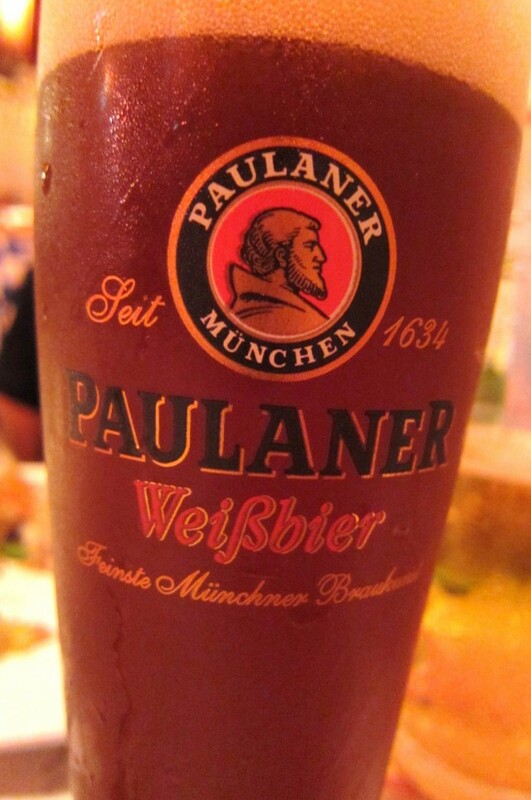 Paulaner is one of ’em popular beers for Oktoberfest, a 16-day festival that takes place in Germany’s Bavaria, specifically in Munich. However it actually ends in early October. Strange. Probably too damn cold to go on. The party started in 1810, coz Prince Ludwig married someone. 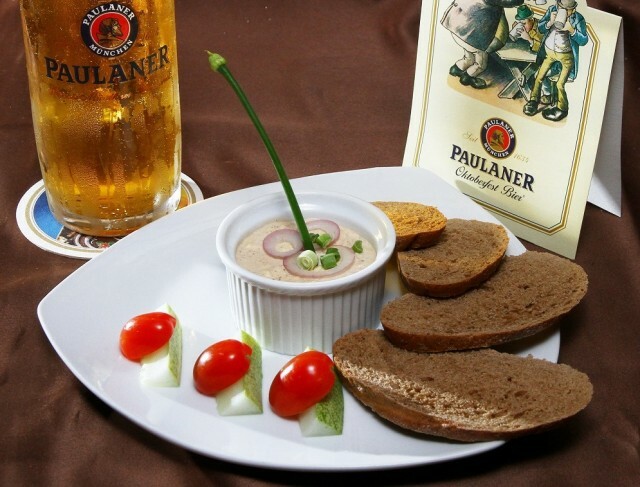 And they lived happily ever after, and thanks to them, there was a good dose of Paulaner beers at The Boathouse (03 7727-4426) in KL’s Taman Tun Dr Ismail, which was accompanied by German food items. None of which i could pronounce. We began the food part cheesily. I dig cheese. 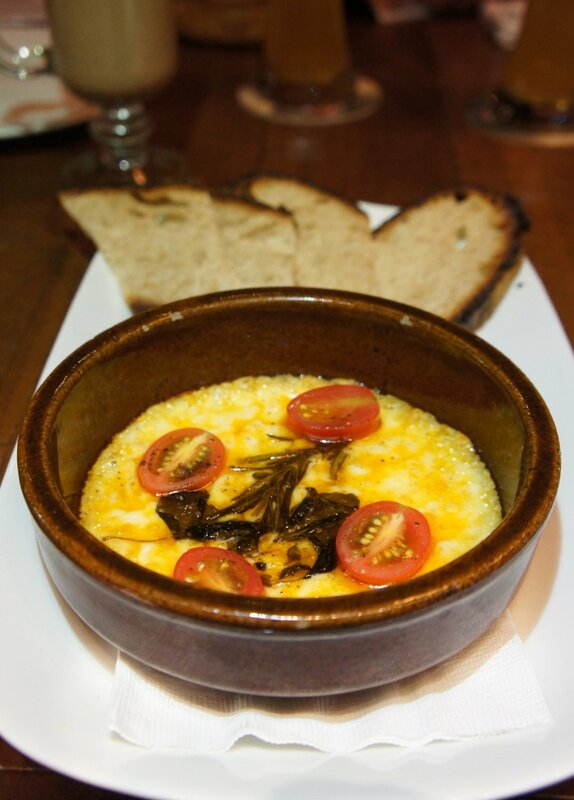 Obatzda is a simple nibbler with ultra-creamy, custard-like cheese, with bits in it. Onion bits. Great with bread, or neat. Then it was time for Griessnockerlsuppe mit Leberknodel (I’m serious). It’s soup with liver bits in it. 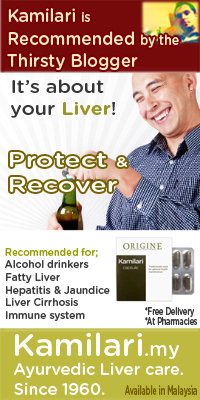 It’s liver that dont taste like liver. Not being a liver fan, i wolfed in anyway coz it was done like meatballs. I dig meatballs. Yess. I dig meatballs. 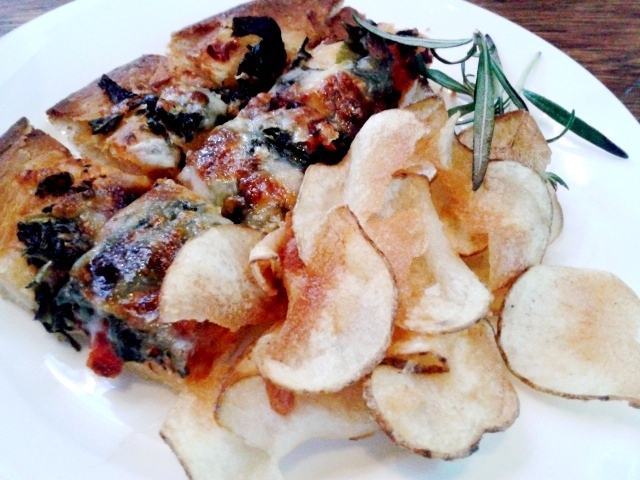 In fact, i dreamt bout pizza last night. A long, rectangular pizza. But it was slightly overdone. 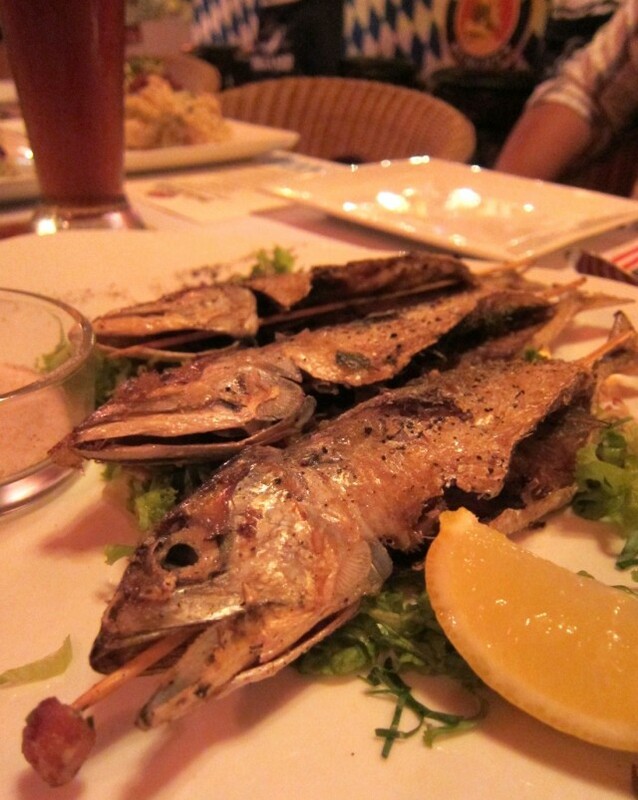 The Steckerlf… watever is a an interesting fish dish, coz it’s BBQed. I didnt think they had BBQs in Germany. Great company to beer, this fish. Besides the smiling face, it’s got a slightly crispy skin and moist meat. Perfectly done. Compliments to Chef Law, and to the fish. Since my stomach has shrunk significantly (affects solids, not liquids. Liquids sail right thru), i started to struggle when Rinderr…sumtin appeared. But whatever little i had was good. 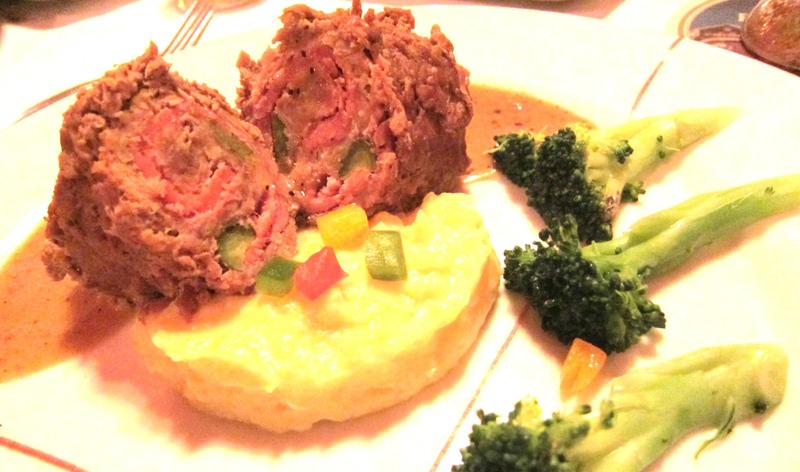 It’s beef roulade, meaning it’s rolled up like a .. hmm.. gotta think for this one. Yea, like that sponge cake roll thing. 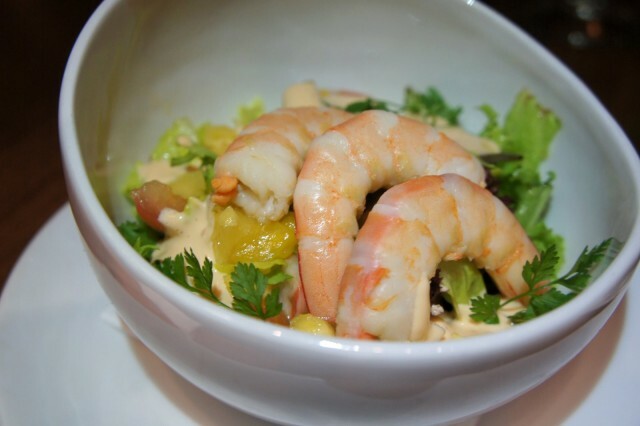 Makes it tender and easy to enjoy. Minced n all. Pancakes? Dessert?? Fuggedaboutit, was stuffed. 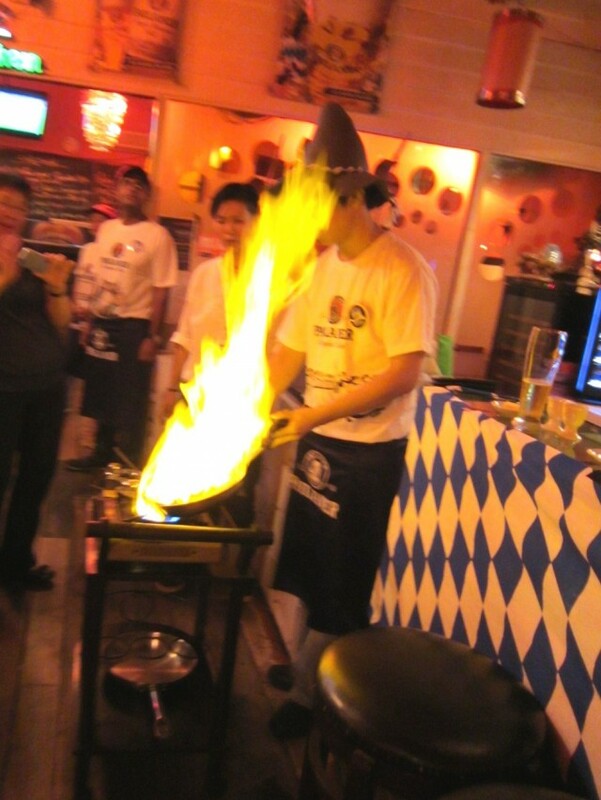 But the prep looked kinda interesting, with flames and great smells of the cherry and alcohol toasting up. 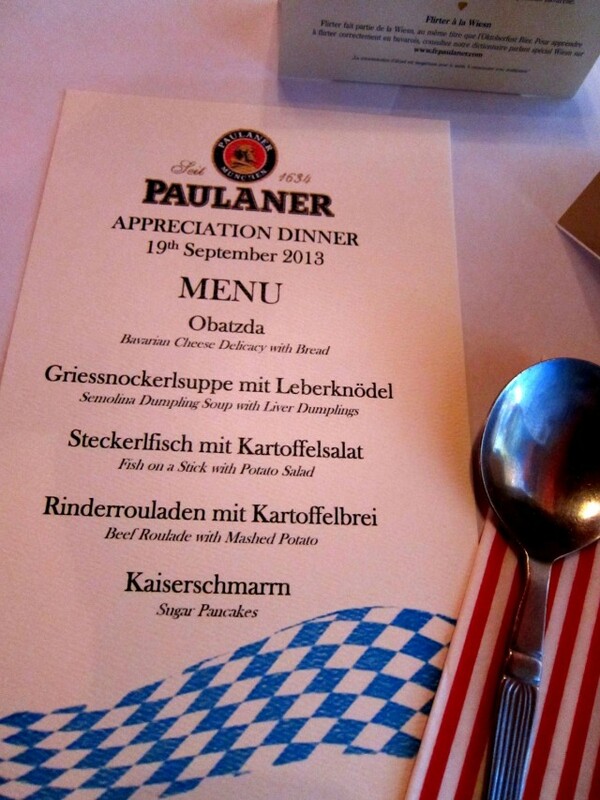 Unlike many other Bavarian breweries, that serve wheat beers, Paulaner serves a lager for Oktoberfest. A crisp, clean one. 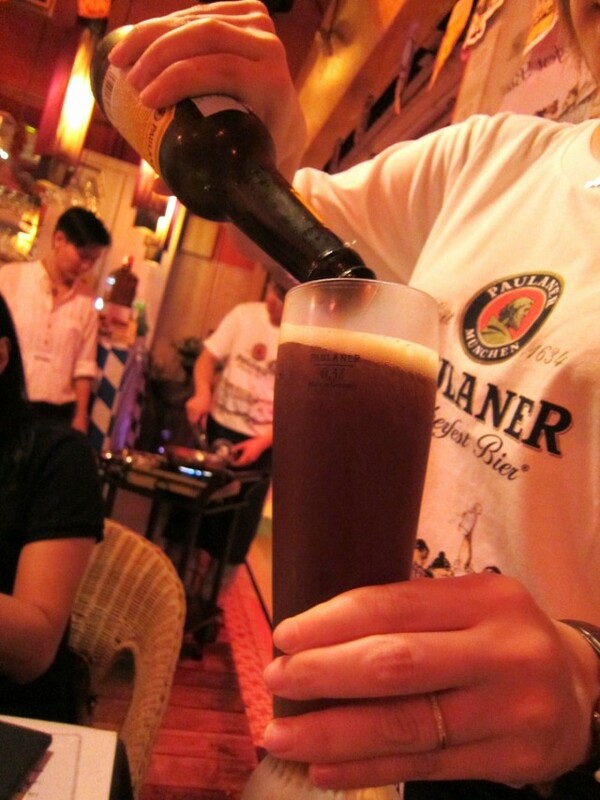 Luuurv the Paulaner Dunkel. Could probably have a glass every morning with bacon. Perfect. You can enjoy the same feast at The Boathouse (closed Sundays tho) during the month of October. The whole month. Coz we take our beer-drinking seriously.